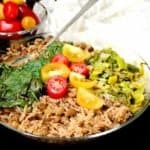 Food, for those of us who love eating and making it, has to be gorgeously delicious, ravishingly beautiful, and, well, easy enough to prepare. And while French food definitely fits into the first two categories, those not used to making it day in day out often see it as being an intimidating test of patience and skill. All that marinading, julienning, chiffonading, friseeing, sauteing, flambeing…mais non! But then again, we cooks do love a challenge. Thanks to other wonderful Foodbuzz bloggers who voted for me and the support and prayers of my incredible readers, I advanced last week into the second round of Project Food Blog, Foodbuzz’s contest to select the next online food blog star. This week, Foodbuzz wants contestants to cook something that’s out of their comfort level, and from a cuisine they don’t usually cook from. As a vegan, stepping out of my comfort zone is something I am used to. 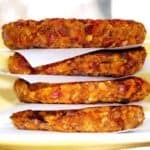 Over many years as a cook and as a blogger I’ve experimented, substituted and tested eggless, dairyless and meatless versions of dishes I used to love when I did eat meat and other animal products. 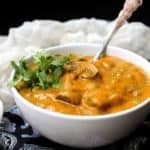 A lot of these recipes have been family favorites, like my Dad’s Not-Mutton Mushroom Curry, or my husband Desi’s favorites like biryanis that are rich and packed with flavor without any meat or animal fat. At other times I’ve created vegan versions of breads seemingly impossible to imagine without eggs and butter fat, like my Vegan Whole-Wheat Challah and my Avocado Brioche. But blue-ribbon-worthy French cuisine…now that’s a challenge for the hardiest cook. And who can resist it? 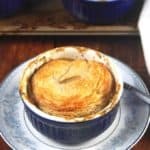 On this blog you’ll find French recipes I’ve made or veganized, like the brioche, or my Tarte Tatin, my Whole-Wheat French Bread, and my coriander and sweet potato quiches. But there is one cookbook that has always challenged my courage as a cook, and one I’ve never dared to veganize from. Julia Child’s Mastering the Art of French Cooking. I had picked a copy of this classic years ago at a yard sale and all these years it has just stood there on the shelf, pretty much useless. Just about every recipe required a dozen pounds of butter, a side of beef, or 20 dozen eggs. Or so it seemed to me. Then along came the Foodbuzz challenge, and I thought, do I dare? And I did. 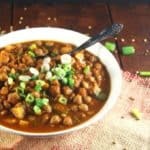 I picked a recipe that looked complicated enough to be a challenge, but simple enough to veganize without taking away its true character. Gateau de Crepes a la Florentine. 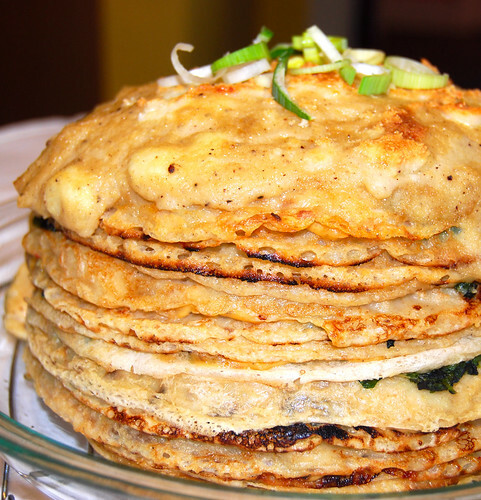 In plain English, a giant stack of crepes layered with a creamy white mushroom stuffing and a verdant spinach and leek stuffing. All of it then gets smothered with bechamel sauce and baked in a hot oven until it’s ready to devour. Now before I give you the recipe, here’s a confession and, perhaps, a warning: this recipe is a test of patience. There’s all that crepe-making– 24 in all– and the two different kinds of stuffing to make, and the bechamel sauce. Top it all with the layering and the baking and there’s a whole weekend afternoon absolutely lost. But when you dig your fork into all those layers and they just melt on your tongue, you’ll know it was well worth it! Here you go, all. Enjoy! Place all the wet ingredients in the blender, add the dry ingredients, and blend until mixed, no more than a minute. Scrape down any flour stuck to the sides and blend again for a few seconds until well-mixed. To make the crepes, heat a crepe pan or a 5- or 6-inch cast-iron skillet. Brush very lightly with oil. When the pan starts to smoke a little, take it off the stove with one hand (be sure to wear mitts if using cast-iron), and pour 1/4 cup of the batter into the center. Very quickly, tilt the pan around so the batter spreads thinly and evenly and coats the bottom of the pan. In about 60 seconds, you should see the edges start to brown a little. Gently, with a spatula, lift to see if golden-brown spots have appeared. If they have, flip over the crepe and heat on the other side for about 20-30 seconds. Remove the crepe to a rack to cool. Repeat with the remaining batter. You should get around 24 crepes from the batter, but if you get more or less don’t panic. You’re going to layer it all and no one will know the difference. Turn off the heat. Add the heated soymilk, whisking all the time, until you have a smooth sauce. Return to the heat. Add the seasonings and the cheese and whisk until the sauce is smooth again. Bring to a boil and turn off. 1 16-oz package of frozen, chopped spinach. Place in a microwave-safe bowl with 2 tbsp of water and zap for about 7 minutes until the spinach is quite tender. Heat the oil. Add the leeks and saute for a minute. Drain and add the spinach and saute for another 2-3 minutes to let the moisture in the spinach evaporate. Stir in 1/2 cup of the bechamel sauce and cover. Cook for another 8 minutes. Turn off. 1 cup vegan cream cheese, like Tofutti or Sheeze. Mix the vegan cream cheese and almond milk until smooth. Add salt and pepper. In a skillet, heat the oil and saute the mushrooms and leeks about 5 minutes or until softened. Add the vegetables to the cream cheese and mix well. Use a glass baking dish wider than your crepes. I just used my pie dish. Oil the bottom of the dish. Then place 1 crepe on it and smear on some of the mushroom sauce. Place another crepe above this and slather with the spinach mixture. 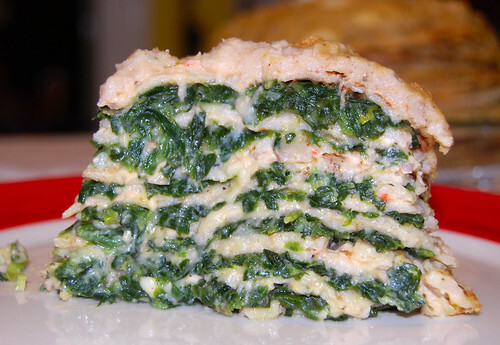 Continue to layer, alternating the spinach and mushroom stuffings, until you have used up all but one crepe. Place the last crepe on top and pour over the bechamel sauce. If desired, sprinkle with 3 tbsp of grated cheese. Place in a preheated 350-degree oven and bake 30 minutes or until it is just starting to brown on top. Remove from oven, cool for five minutes, then cut in and serve. Where can I vote for you? Vaishali, that looks wonderful. 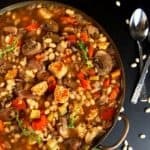 I’m not very familiar with French cooking, but like you, I’ve learned through veganism and cooking in general that it’s not always so intimidating to step out of one’s comfort zone, and often the results can be quite gratifying. Thanks for sharing! I wish you all the best with Project Food Blog! 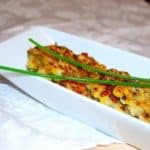 Nice job veganizing a complicated dish! Good luck for round #3! Fantastic looking crepes. Congrats on advancing to the second level. Best of Luck, Vaishali. Good luck for the next round. Absolutely amazing Vaishali!! What a feat this must have been – and congratulations on advancing into the contest – hope you win! Looks gorgeous and delicious, and yet easy to prepare. 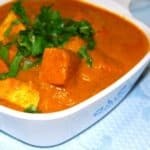 Love to try it soon, Vaishali. vaishali i just posted a comment, but think it has vanished… just stopped to say, i loved your post. i am totally with you on how often vegetarians and vegans have to step out of their comfort zones. Woah, that does look like a test of patience! 24 crepes!? I have trouble making 6 good ones sometimes. But a delicacy like that looks very worth it, yum! I am definitely not only voting for my vegan cronies but also because this is AMAZING!!! I am going to be making this soon. Looks so savory. Congrats! This is amazing! You got my vote! Your main photo is one of my favorite in Challenge #2 — It looks so good to eat. I vote for that 🙂 Good luck. That is one massive tower of crepes! How many people did it take to eat it? You’ve got my vote, can’t wait to see what’s next. Tiffany, DJ, Latha, Satya, Srimathi, Miri, Sanjeeta, Rajani, Priya, T, Noelle, Cherine, Shelly, Lick My Spoon: Thanks, all! Whoa! That looks crazy good..and awesome! Great post! Looks mouthwatering. I voted for you! wow what a tempting click. looks sooo good. Veganizing Julia? Impressive. Also, you’ve made a vegan brioche? Both of these things get my vote! I am so happy and proud of you to be second round of food buzz project! This recipe is sure out of my comfort level too but look like heaven. Maybe, some day when I have bit more time, I will try it on! Wishing you best on this food buzz challenge, for me you are always the best and winner!